Windlesham, Surrey, Updown Hill Post Office circa 1910. Windlesham is a village near Bagshot. 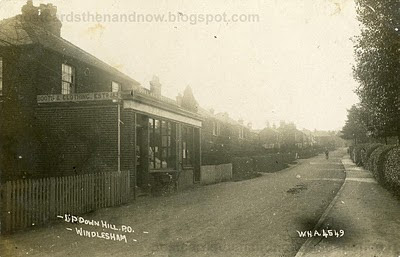 In this view we can see the marvellously named Updown Hill and the village post office. It is very good to see the building is still a post office, that must be something of a rarity these days. It is largely unaltered since this picture was taken a hundred years ago except for the obvious side extension. The picture was printed from an older negative that was clearly a little 'tired'. If you look closely you can see an old-fashioned pram outside the post office. The sign on the side of the post office states 'Boots and clothing Estd 1859'. Postcard by W. H. Applebee, from an earlier negative by Young & Co. Click to enlarge.